Located on the grounds of the Château de Jonvilliers, the Cottage du Potager is a 125 sq. m. (1375 sq. ft.) self-catering accommodation that sleeps six and features two en suite studio bedrooms upstairs. 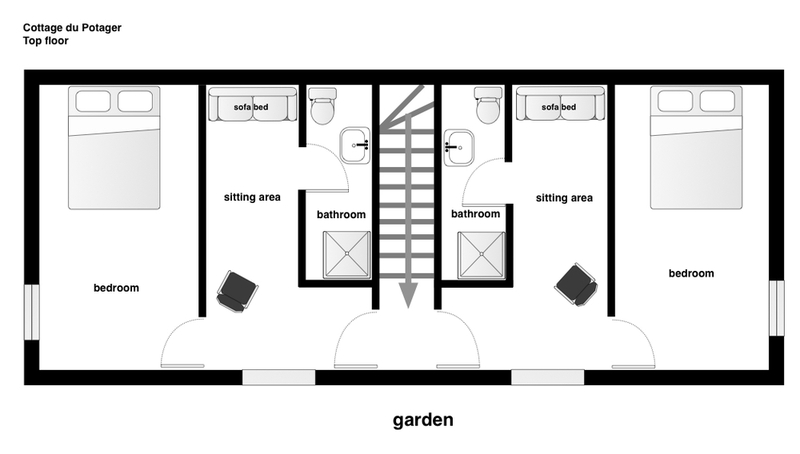 Downstairs is a living room, kitchen and dining room. It also has a large private garden and a laundry room. Fifty meters from the château, at the bottom of the back garden, sits the Cottage du Potager. This 125 sq. m. (1375 sq. ft.) self-catering accommodation used to be the gameskeeper’s house. It sleeps six and features two en suite studio bedrooms upstairs. Downstairs you’ll find a living room, kitchen and dining room. It also has a large private garden and a laundry room. The first thing you will see when you enter the cottage is the fully fitted kitchen. It comes with a refrigerator-freezer, oven, cooktop, dishwasher, microwave oven, toaster and coffee maker. Cookware, serving dishes and utensils are also provided. Off to the left of the kitchen is the large dining room. There is a table, cutlery and tableware for six people. The downstairs living room is decorated in bright yellow tones and toile de Jouy fabrics. There is a full bathroom off the hallway leading to the living room. At the top of the stairs are two bedroom suites. Each is comprised of a bedroom, sitting area and private bathroom (shower). There is a queen bed in the bedroom and the sofa in the sitting area can be converted into a single bed. The nearest train station is 10 minutes away. Parking costs €1.50 for the day. It’s a 40-minute train ride into Paris (Montparnasse); 25 minutes to Versailles.